Clock Face Diameter with Ring 3 ¼"
The dial and construction of this metal Altimeter Clock is so authentic that it looks as if someone just pulled the altimeter instrument right out of the cockpit of a WW II aircraft. 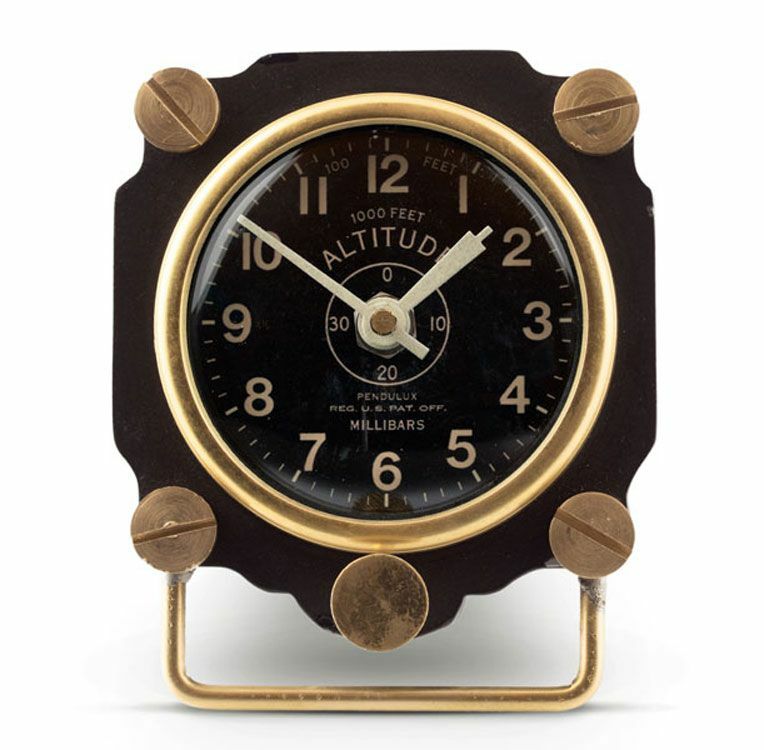 The realistic looking dial shows the remnants of a sub-dial that displays altitude per thousand feet, and the main hands denoted altitude per ten and hundred feet. The Altimeter Clock itself is cast, machined aluminum making it a durable, heavy weight desk, table or shelf clock. 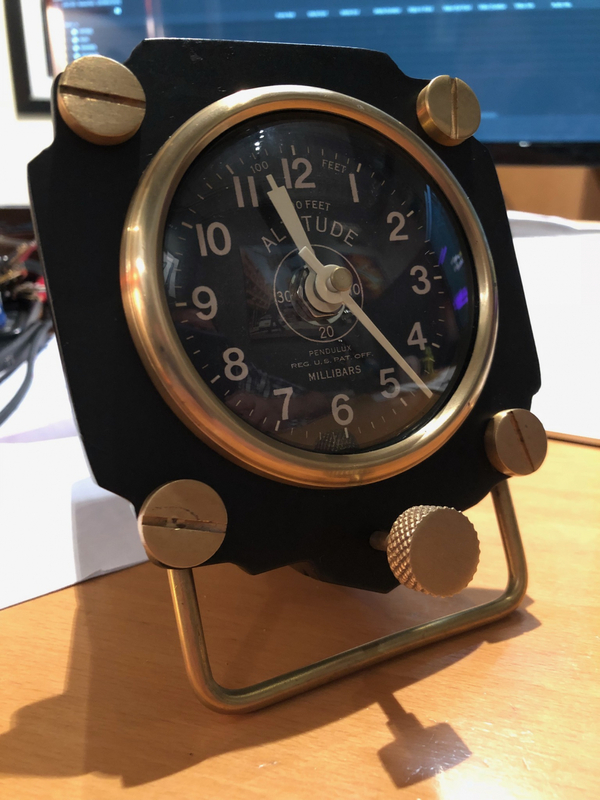 The brass screws, and knob add to the authentic look of the black colored Altimeter Clock while quartz movement will keep the clock with precise time. A "AA" battery is needed for use. 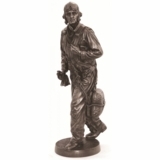 An ideal pilot gift or gift for an airplane enthusiast. Check out our Altimeter Desk Clock with Polished Aluminum/Brass for those seeking a lighter airplane-themed décor. Beautiful, quality piece which I know my husband will love. Very well packaged. Thankyou. Product was exactly what my aviation friend did not have. HE LOVED IT! Normally his plane trinkets go into his office at work, but this was so beautiful and classy his wife is letting him have it as a place of pride in the house. Triumph gift at last. 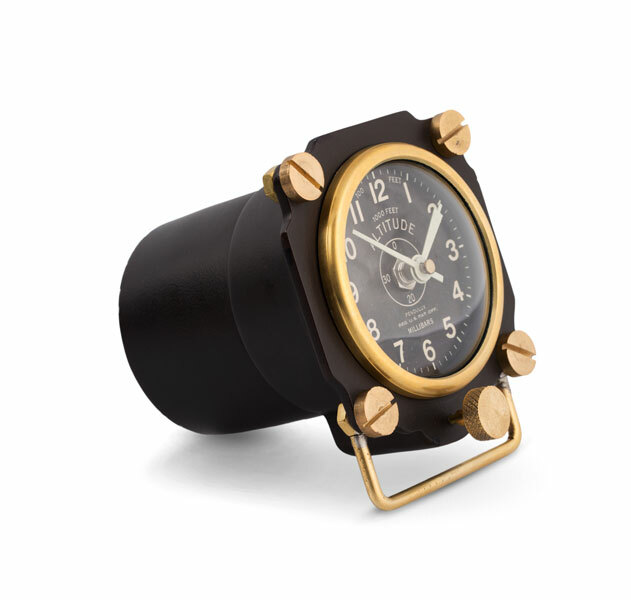 Truly a special piece to own the altimeter clock in black and brass. Very nice desk clock and looks sharp. Overall perhaps a bit pricey, but looks good. Purchased as a CHRISTMAS gift for my son; it's worth the money and is beautiful! High quality and elegant. It's on his desk and makes a real statement. Highly recommend it! Tailwinds was efficient and sent it to me quickly and well packed. Would purchase again from them. The clock arrived much quicker than I anticipated. The packaging was superb. The clock really is metal and is surprisingly heavy. The person I gave it to as a birthday gift set it up immediately and remarked on its quality look and feel. I recently purchased this clock and have to tell you, it's totally awesome. Incredible quality and value at an unbelievable price. Could easily sell for twice their cost. 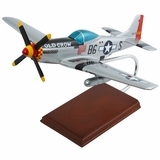 This is a stand out product and a great piece of aviation memorabilia for the collector or anyone that loves cool stuff. Plus, their Customer Service Department is top notch. Would make a great (and unique) Christmas gift. You won't be disappointed. The attention to detail, as well as the craftsmanship is outstanding. Though this is a replica of the original it is hard to tell that it is not the real thing. This was money well spent for a bit of nostalgia that I can be proud to put on my business desk! ProsMaterials feel and look like the original. Manufacturing and quality are superb.